Pour yourself a mango juice and sit back to savour a most informative and interesting book on a little-known mixed race community created in bygone times in India by the union of European male colonialists, predominantly the British, and Indian women. In the years following India's Independence from the British Raj in 1947, some 50,000 Anglo-Indians, as they came to be called, migrated to Britain in the belief that Britain was their true home, despite being discouraged from doing so by their earnest community leaders Henry Gidney and later Frank Anthony, who had urged them to stay on in India and help develop the land of their birth. Only a minority remained. Those who moved to Britain, however, quickly discovered that their rosy expectations of life in the "mother country" amounted to nothing more than wishful thinking. They faced a hostile reception that alarmed and depressed them in equal measure, encountering racial prejudice in employment, accommodation and society generally. “Britain’s Anglo-Indians” is a deeply researched book penned by Rochelle Almeida, clinical professor of global cultures in the Liberal Studies Program at New York University. She charts this community’s remarkable evolution in stunning detail, pulling no punches, and rightly includes as Anglo-Indians the mixed-race offspring of other European colonialists who occupied the subcontinent, namely the Portuguese, French and Dutch. Almeida quizzes an array of elderly first-generation migrants and succeeds in capturing their earliest thoughts and feelings with complete candour. Keeping her interviewees anonymous to encourage them to open up, she bagged quotes like this, from an accountant in Wembley: "My Dad thought that I could become an accountant or a doctor in the UK. However, as soon as I came here, I realised that there was so much colour-prejudice that you were lucky to be able to find any job. For two years, I was too ashamed to tell my folks in India what I was really doing in England - manual labour - loading TVs from a wheelbarrow into a truck." Almeida brings the eventful story up to date, recounting how Anglo-Indians who moved to Britain all those years ago are faring today, summed up in this quote from a retired Anglo-Indian journalist: "Life is so very different and wonderful from what is was when we arrived here... with our bizarre misconceptions, culture clashes, sensitivities and chips on our shoulders the size of the Taj Mahal. We are now more mature and happier than we have ever been." The book is worth reading for the profusion of quotes alone spanning every aspect of Anglo-Indians' first uneasy, and then contented, lives in Britain, but there is so much more on the genealogical, historical and political fronts to commend this book which is spread over six fascinating chapters, helpfully divided into persuasive, bite-sized sections. 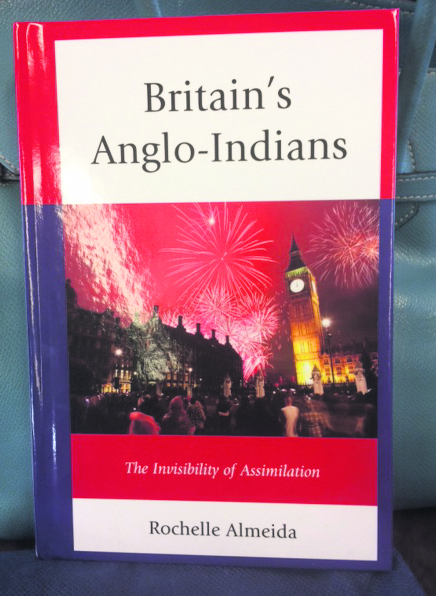 "Britain's Anglo-Indians" is published by Lexington Books.USA (US$100, www.rowman.com).